Look up satellite in Wiktionary, the free dictionary. A satellite campus or branch campus is a campus of a college or university that is physically at a distance from the original university or college area. This branch campus may be located in a different city, state, or country, and is often smaller than the main campus of an institution. The separate campuses may or may not be under the same accreditation and share resources or they share administrations but maintain separate budgets, resources, and other governing bodies. In many cases, satellite campuses are intended to serve students who cannot travel far from home for college because of family responsibilities, their jobs, financial limitations, or other factors. The availability of branch campuses may increase higher education enrollment by nontraditional students. Electronic communications technology has helped to facilitate the operation of satellite campuses. Classes taught at one campus can be transmitted to other locations via distance education, students at branch campuses can access library materials on the main campus electronically, and technology allows institutions to administer registration, admissions, and financial aid transactions remotely. One growing trend is the establishment of international branch campuses. These are satellite campuses of a parent institution that is located outside the country where the satellite campus is located. The number of international branch campuses worldwide grew from 35 before 1999 to 162 in 2009, including 78 branches operated by United States universities. As of 2009, the United Arab Emirates was the host of 40 international branch campuses, more than any other nation. There were 15 international branch campuses in China, 12 in Singapore, nine in Qatar, and six in Canada. In addition to the United States, the home countries of institutions with international branches included Australia, whose universities operated a total of 14 international branches; the United Kingdom, with 13 international branches; and France and India, each of whose universities had a total of 11 international branches. Although the overall number of international branch campuses has grown rapidly, a total of 11 such campuses closed between 2004 and 2009. A new breed of branch campuses of Indian universities in the Persian Gulf region is emerging which aims to meet South Asians' aspirations to study abroad in a cost-efficient manner. There are several regional satellite or branch campus consortia but only one national association in the United States. The National Association of Branch Campus Administrators, NABCA seeks to unify higher education officials, working to advance scholarship, provide research opportunities, and facilitate networking events, both online and at a national conference each year. St. John's University has two satellite campuses. One is located in Rome, Italy and offers two graduate degrees as well as numerous study abroad opportunities for undergraduate students. The other is located in Paris, France and offers several undergraduate study abroad programs. Ohio State University has five satellite campuses; located in Lima, OH, Mansfield, OH, Marion, OH, Newark, OH and the Agricultural Technical Institute in Wooster, OH. Ohio University has eight satellite campuses and centers; located in Cambridge, OH, Chillicothe, OH, Ironton, OH (Southern Campus), Lancaster, OH, Pickerington, OH (Pickerington Center), Proctorville, OH (Proctorville Center), St. Clairsville, OH (Eastern Campus) and Zanesville, OH. Gratz College has an all-girls undergraduate campus. It is located in Baltimore, MD and offers many degree options as well as study abroad opportunities for undergraduate students. Arizona State University has three satellite campuses; one located in Glendale, AZ called the Arizona State University at the West Campus; another located in downtown Phoenix called Arizona State University at the Downtown Phoenix campus; and its third located in Mesa, AZ called Arizona State University at the Polytechnic campus. The University of Michigan has two satellite campuses; one located in Flint, MI and the other in Dearborn, MI. Drexel University has three branch campuses: Drexel University Sacramento in California, Drexel University at Burlington County College in South Jersey, and the LeBowe College of Business Malvern Campus in suburban Philadelphia. The University of Toronto Scarborough and the University of Toronto Mississauga are satellite campuses of the University of Toronto. The Weill Cornell Medical College in Qatar and Weill Cornell Medical College of Cornell University at New York City are satellite campuses of Cornell University. The University of Waterloo maintains three satellite campuses in addition to its main campus in Waterloo, Ontario, Canada. The School of Architecture moved from the main campus to a satellite campus in Cambridge, Ontario in 2004 due to lack of space at the main campus and as an initiative to spur economic activity in Cambridge. The School of Pharmacy relocated to a satellite campus in downtown Kitchener, Ontario in 2008. The University of Waterloo Stratford Campus was established in 2009 for Faculty of Arts programs centred on digital media. University College London has established branch campuses in Adelaide, Australia and Doha, Qatar. These campuses are research intensive with all studies at graduate level only. Pennsylvania State University has 19 commonwealth campuses around the state, known as the Commonwealth Campuses, enrolling approximately 40 percent of the university's students. The Branch campuses of the University of Wisconsin system only offer two-year programs intended to allow students to transfer to the university's main campus or other four-year universities. In 2008 Michigan State University established a satellite campus in Dubai, offering undergraduate education in five majors plus one master's degree program. The Dubai campus was designed to have the same curriculum and standards for admissions and student work as the university's main campus in Michigan. The university announced in 2010 that it was terminating the undergraduate program in Dubai after just two years due to insufficient enrollment, but would continue to offer a master's degree program in human resources and labor relations in Dubai. The University of Connecticut operates a branch campus on the Connecticut coast in Groton that specializes in oceanography and marine sciences. The University of Winchester in the UK has a satellite campus in the town of Basingstoke 20 miles to the north east of the main campus (Chute House Campus)[permanent dead link]. Universities in Nigeria made extensive use of satellite campuses to accommodate growing demand for tertiary education in the latter decades of the 20th century. In 2001, the nation's National University Commission (NUC) directed that most satellite campuses be shut down. The NUC was concerned that the proliferation of satellite campuses was resulting in lower academic standards and was happening primarily for a profit motive and not to provide quality education. Under the new NUC rules, satellite campuses were allowed only within 200 km from the university's main campus and within the same state in which the main campus is located, and their staff were required to be "directly or indirectly appointed by main campus in line with laid down academic standards." In spite of these restrictions, as of 2009 Lagos State University enrolled more than 61,000 students at satellite campuses. The university, which was initially formed with a main campus in Ojo and additional campuses in Epe, Ikeja, and Surulere, also operated external campuses at Anthony Village, Badagry, Ikorodu, Lekki, Festac Town, Ikoyi, Isolo and Agege. The University of Nottingham includes 4 campuses and a teaching hospital within the UK, alongside international campuses in Malaysia and China. Cranfield University opened a Campus in Kitakyushu, Japan in April 2001. The University of Southampton opened a Campus in Johor, Malaysia in October 2012. Webster University, a private non-profit school in St. Louis, has more than 60 locations, including full residential campuses in Europe and a new campus in Accra, Ghana. Northumbria University has a satellite campus for the School of Design in London. The University of Castile-La Mancha has four main campuses: Albacete, Toledo, Ciudad Real (which includes the university administrative buildings) and Cuenca. There are also two branch campuses in Talavera (associated to Toledo) and Almadén (associated to Ciudad Real). There used to be a non-campus centre in Puertollano, also associated to Ciudad Real, but was closed in 2011. The Universidad Nacional de Educación a Distancia has its campus in the Ciudad Universitaria of Madrid, but keeps a two-level branch system of 'Centros Asociados' which in turn have their own 'Extensiones'. 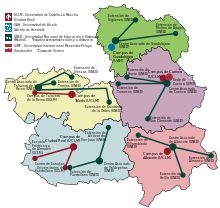 Universities in Castile-La Mancha, showing branch campuses (all UNED centres are branches of the Madrid central campus). The Rochester Institute of Technology has four international satellite campuses, the RIT Croatia in Zagreb, Croatia and in Dubrovnik, Croatia, RIT Dubai in Dubai, United Arab Emirates, and American University in Kosovo in Pristina, Kosovo. The Farm School in Tennessee allows homeschooling families to affiliate with it through a "Satellite Campuses" program. This program enables homeschooled children to be enrolled in a state-recognized school that is not affiliated with any religious denomination. Churches attempting to expand their reach by offering worship and other programs in new locations may refer to these added locations as "satellite campuses." Some megachurches have increased their number of parishioners and extended their geographic reach by opening new locations that are referred to as "satellite campuses." A satellite church campus may use video technology to connect to the church's main location. ^ "The New Wave of Branch Campuses". DrEducation.com. 2011-07-16. Retrieved 2011-09-06. ^ Melissa Nann Burke, Lancaster County megachurch expands into York County; LCBC will open a campus in Springettsbury Township, and says it may ultimately draw 3,000 people Archived 2015-02-26 at the Wayback Machine, York (Pennsylvania) Daily Record, July 18, 2010. Accessed July 24, 2010. Samuel Schuman, ed. (2009). Leading America's Branch Campuses. American Council on Education series on higher education. R&L Education. ISBN 9781607091783. Asa Smallidge Knowles, ed. (1977). "branch campuses". International encyclopedia of higher education. 3 (B–C). Jossey-Bass Publishers. pp. 658 et seq. ISBN 9780875893235. Kemal Gürüz (2008). Higher education and international student mobility in the global knowledge economy. SUNY Press. pp. 105 et seq. ISBN 9780791474136.